Scholars have appropriately described [Stein’s] works in the context of gender performativity and embodied subjectivity, informed by the sumptuousness of her materials, which invite a haptic or touch centered response. Front and side views of Heroic Compassion. 2009. Wood, metal, paper, and mixed media. 65" X 18" x 14". 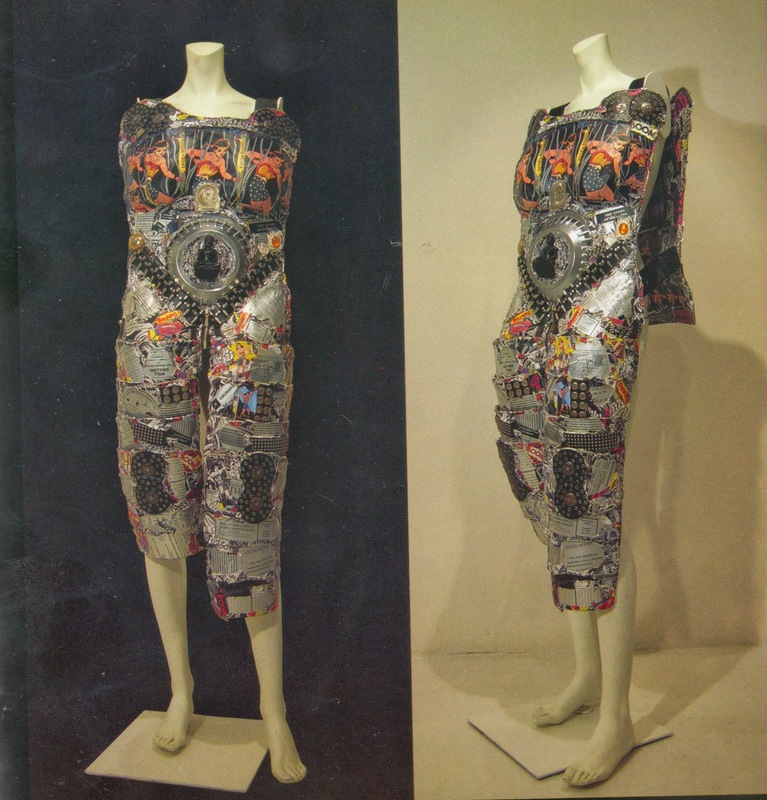 From "Body-Swapping Armor: New Yorks by Linda Stein." NY: Flomenhaft Gallery. Newer works have jettisoned these urban and starkly if comic (literally!) heroic themes in exchange for a subtle use of natural materials, most particularly sea shells that form robust but softer Venusian sensual (female, of course) torsos. These later works appear to be a by-product of Stein’s ecofeminism, in general defined by scholar Karen Warren as the conceptual and also emotional-spiritual “position that there are important connections between how one treats women, people of color, and the underclass on one hand and how one treats the nonhuman natural environment on the other” (Warren quoted in Filippone’s article). They also embrace a visceral love for an environment always making our human “selves” an environment, too, ever shifting our own figural embodiment trappings. Those trappings, our “costumes” of the day, attempt to “capture” a fleeting glimpse of our moving images in the mirror, our gendered and gendering performances in society. Hence, Stein’s continuous play upon the performativity of identity and violence – which most cultures seem to perpetuate as a mainstay of the human condition -- overrides that very idea that violence is here to stay. This notion that violence is a social institution that can never be outrun, no matter how many warplanes and warriors dot the skies and fields in theaters of war, is shown through Stein’s postmodern reinvention, suggesting that this mode of thought is outdated in a global (and nuclear) era. The performance aspect of her work realigns “violence” as a reactive state of unacknowledged and suppressed identity struggles. Violence as part of the performance cycle can now be shed, like so many used-up ideas of old “selves.” It can be recycled through the literally “recycled” materials of postmodern art in the service of a more peace-loving humanity. What is remarkable about Stein’s Brave Heart corpus is that Stein herself has such a brave and magnificent heart. Or, as she spells it, HAWT. “HAWT” stands for Have Art Will Travel, an organization Stein founded in 1972 to bring her conceptual art and its messages of peace, diversity and self-acceptance to places in the U.S. that otherwise might not see such art. HAWT is a 501 non-profit that enables Stein – and all her body-armor works and playful sculptures – to travel to towns, villages, tiny museums and schools across the country. Last Tuesday night, I was at a fund-raiser for Stein’s innovative program. There we were shown a presentation by Stein herself, which reminded us that not only can art be beautiful, or rare, or brainy -- yet limited in what audiences it reaches – but that “art opens minds and encourages meaningful exchange,” as stated in her HAWT brochure. Currently the HAWT performance- and installation-art program is featuring Stein’s solo exhibition on the theme of gender-bending and identity questing. The name of this series (which has also been displayed in high-brow gallery exhibits) is appropriately called “The Fluidity of Gender. “ The stated mission of this series through HAWT’s travel aspect is “to inspire and empower people to fearlessly live out their genders.” Art viewers are asked as part of Stein’s installation programs to become participants in staged dialogues wearing Stein’s metal-collage “body armor” sculptures. Discussions about gender and identity flow into lessons during Stein’s installation performances -- about how to handle bullying, for example, a prevalent issue for young people in the schools. HAWT is the apparatus through which Stein can raise resources and funds, so that she can take her program of art performances on the road to the most out of the way venues -- often in very rural American regions that rarely see radical postmodern art. Through HAWT, she has visited the little art gallery in Upstate New York or an underfunded center for the arts in Joplin, Missouri. She has also gone to college campuses, offering her gender-bending performances and installation shows at college sites from the major Duke University to that small community college in Ohio or Pennsylvania. Showcasing her work not for profit but to stimulate discussions on issues of identity related to self-esteem particularly targeting women and minorities, Stein encourages her audiences to consider the multiplicity of how we see ourselves on any given social landscape. And she playfully asserts before women and other marginalized groups how they might emotionally and intellectually protect and empower themselves against homophobia, racism, sexism, and other forms of social oppression that still heavily lace U.S. communities. Since Stein’s most prominent mythic figure in her oeuvre is that of Wonder Woman – the heroine pops up in different version of Stein’s work from the plastered images on the body-armor sculptures to Stein’s gorgeous cloth tapestries -- Stein uses this wonder-full and also non-violent Super-Heroine as a kind of credo. In her writing, Stein has argued that Wonder Woman is a woman’s emblem of heroic strength, saving the day, so to speak, without resorting to traditions of cultural masculinity that embrace institutionalized violence. For this reason, Wonder Woman is very different than your run-of-the mill (and male) Superhero figure. Stein’s programs engage especially younger people on topics such as peer-group bullying as well as the overriding theme of the pitfalls of gender and sexuality stereotyping. Participants of the Tuesday night presentation were allowed – like some of the adults in a film taken at her Tribeca studio and shown also Tuesday – to try on the gender-bending costumes and fabulous body armor. The guests were allowed to perform their own “gender fluidity” before a funky Polaroid camera -- and to take their photo home. You can see more of Linda Stein’s work by visiting her website at www.lindastein.com. The HAWT organization, whose mission is to “spread the word” of performance art and tolerance, relies on generous funding from those who find it in their own hearts to support social justice through this creative, non-judgmental, open-ended means. 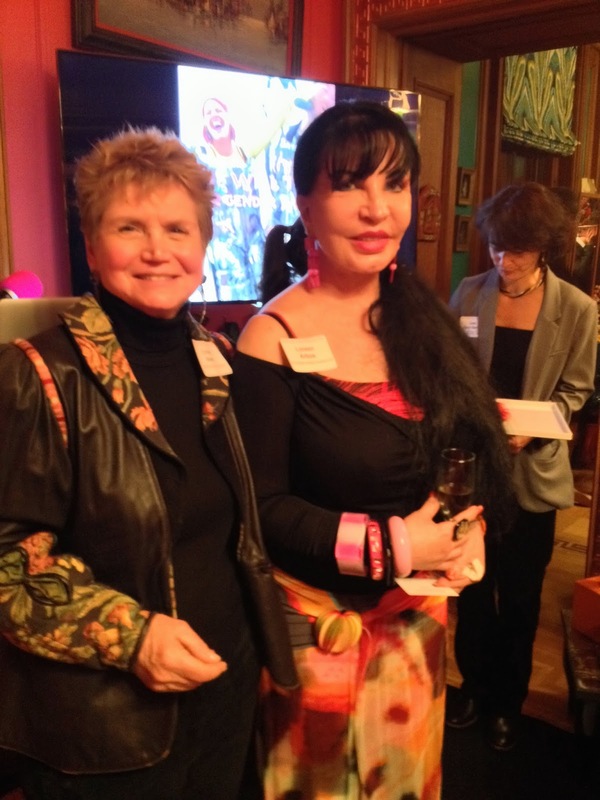 Photo above: Linda Stein with the hostess of the Tuesday night HAWT fundraiser, Loreen Arbus, at the latter’s Central Park West home (Laura Hinton’s Iphone).